Contributor Jim Dixon of Real Good Food knows his fire, and if he says white barbecue sauce is the real deal, then I'm all in. But he begins this essay with a caveat for all the barbecue essentialists out there. [Note] Barbecue semantics: Anytime the word barbecue is used somebody will point out that the usage is wrong. Point taken. Big Bob Gibson created this mayo-based sauce for the chickens he cooked at his namesake Bar-B-Que restaurant in Decatur, Alabama, in 1925. You can buy it bottled right from the source, but it's easy to make. Since tomato-based sauces almost always have some sugar in them, they tend to burn if brushed on during cooking, but Alabama white bbq sauce doesn't. It adds a nicely caramelized coating to whatever you've got on the fire. I don't actually measure anything when I mix up a batch, so these are approximate quantities. Start with about a cup or mayonnaise (I like Duke's), then add about a quarter cup of Katz Gravenstein apple cider vinegar, a tablespoon of good prepared horseradish (or grate some fresh), the same amount of mustard (Dijon or stoneground), a couple of chopped garlic cloves, several grinds of black pepper and a shot of Crystal hot sauce. Brush the sauce on meat while it's cooking, use it as a table sauce for the finished product or try it as a dressing for a salad of raw sweet corn cut from the cob tossed with a chopped Walla Walla sweet onion. I like it on grilled pork shoulder steaks (top photo). Cut about a half-inch thick, these have better flavor than any pork chop. If you can't find them or get your butcher to cut some for you, buy some country style boneless "ribs" (not really ribs but chunks of shoulder). They're typically about an inch thick, so cut them in half, pound to flatten and thin a bit more, sprinkle with sea salt, and let sit for at least 15 minutes. 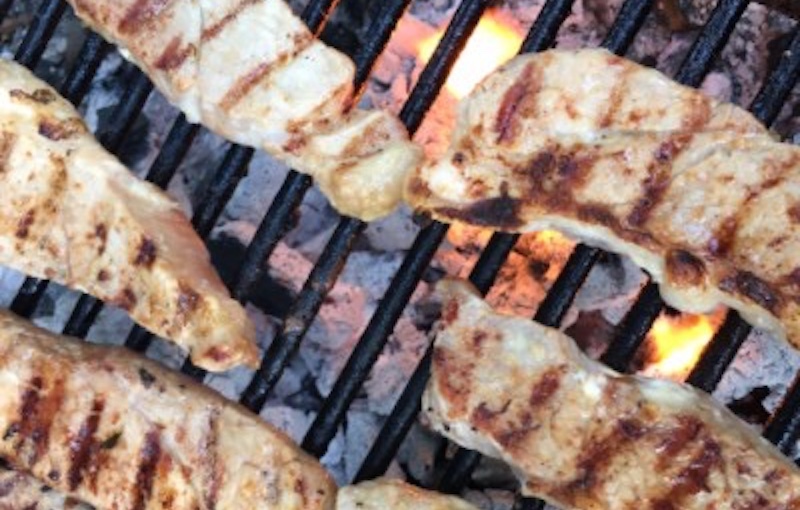 Grill over a moderate fire, basting with the white sauce and turning frequently, for about 20 minutes; move to a cooler part of the grill for the last 10 minutes.